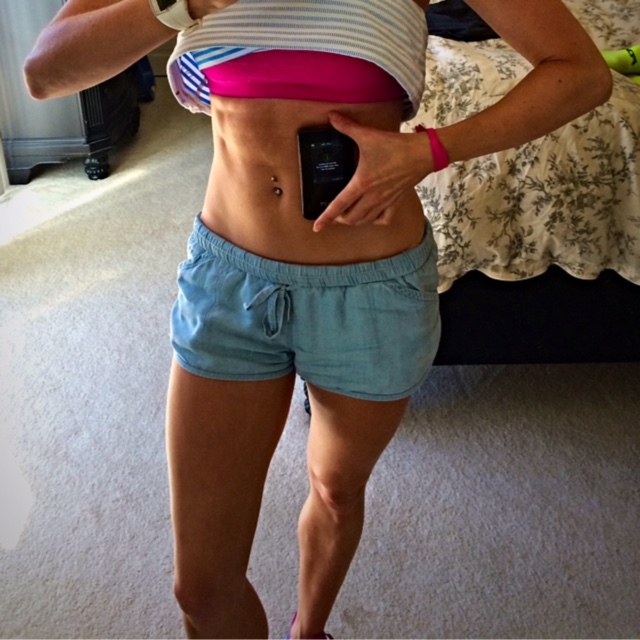 Nikol Klein's Health & Fitness Tips | San Diego Personal Trainer and Women's Fitness Expert Nikol Klein's workout, nutrition, health and fitness tips. Looking for a healthy snack to satisfy your sweet tooth? I have found a great solution! First of all, you have to try Quest Bars. Quest Bars are high protein, gluten free, lactose free, no sugar added, with only 2-6 grams of active carbs (depending on the bar). Oh, and did I mention that they taste incredible? 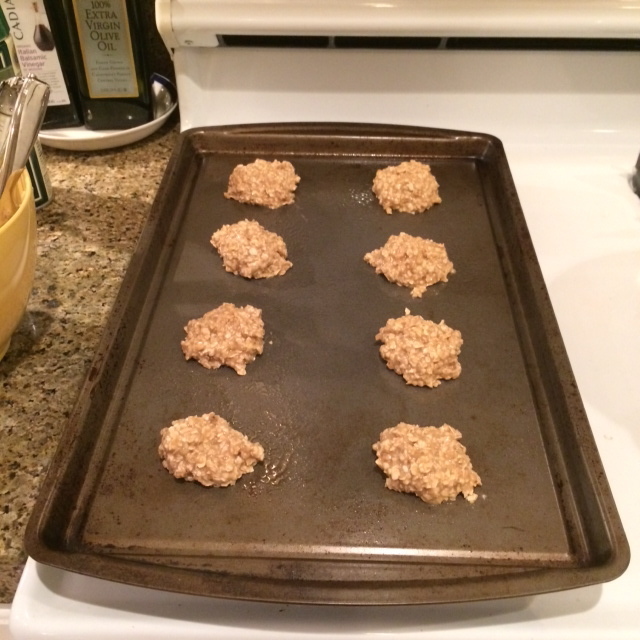 I heard from various people that they bake their Quest Bars for added texture and taste so I decided to give it a try! Baking definitely enhances these already tasty bars. I can’t wait to try it with my favorite flavor – Apple Pie – which contains real apples. 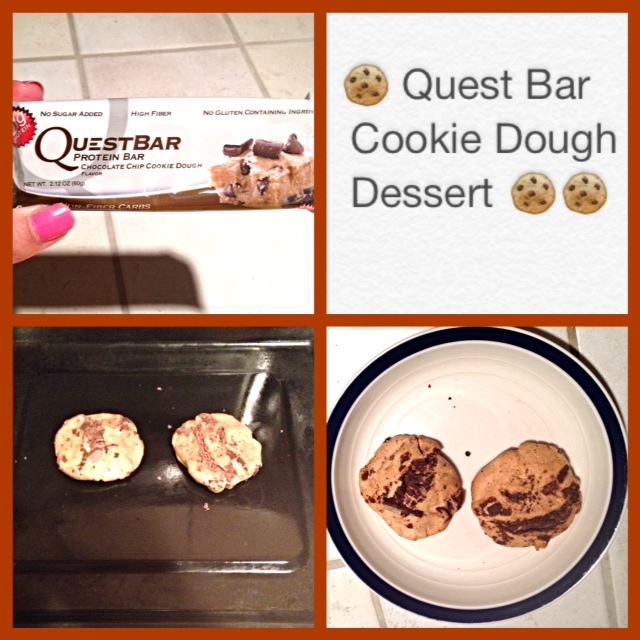 • Take one Quest Chocolate Chip Cookie Dough Bar and break it in half for larger cookies, in fours for smaller cookies. 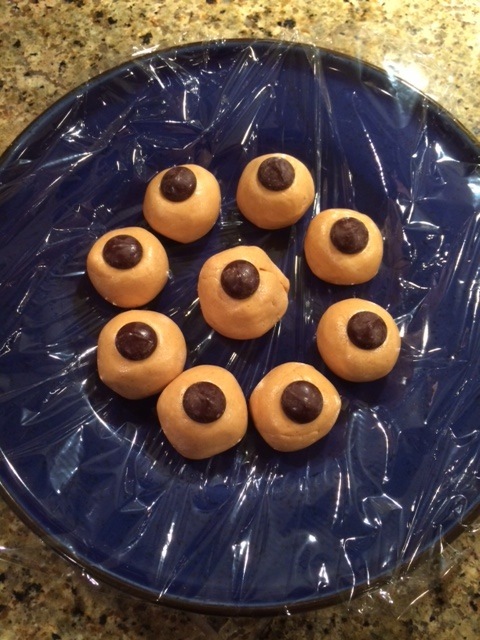 • Roll the pieces into balls, then flatten into cookie shapes. • Place on a baking sheet. The will stick so olive oil or parchment paper are suggested. • Bake at 400º for 5-7 minutes. • If you want a crispier texture, flip the cookies halfway through baking. • Let cool and enjoy! Wondering where to find Quest Bars? You can pick them up at your local GNC or by visiting their website: http://www.questproteinbar.com. 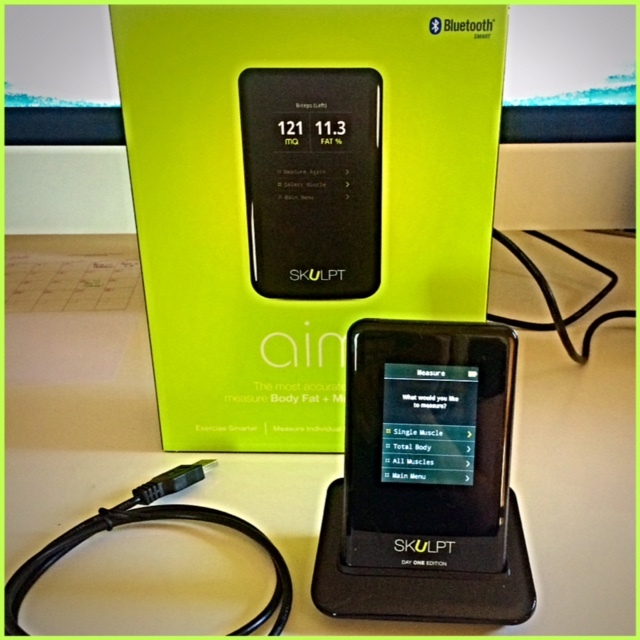 While I am a bit traditional when it comes to measuring body fat and quantifying fitness results, I was super excited when I was asked to test and review the new “Skulpt Aim” device. Skulpt uses leading edge technology to measure bodyfat and muscle quality. As a personal trainer I am always open to new products and ideas that take our profession to the next level. While opening up the package, I was very impressed with the quality of the packaging – I almost felt as if I was opening up a new Apple product. Everything was carefully placed and displayed in the box. Inside the box you’ll find the Skulpt Aim device, a charging cradle, USB cable, travel bag, as well as a spray bottle. After a few hours of charging the device, I was ready to start measuring. The instructions are pretty straight forward – once you sync the device to your phone via bluetooth, you can begin measuring. Simply spray the sensors on the back of the Skulpt Aim device and press on the muscle you want to measure. Very easy to use. One great feature that I love is that there are how-to videos on measuring each body part correctly. Since I had a bit of trouble getting consistent readings at first, this was very helpful. Before using this on clients I wanted to make sure I had consistency. I felt that I was getting the most accurate readings from my abdominal region, while having some trouble with the biceps and triceps as I have a petite frame. All in all this is a great product for those who are interested in the scientific side of fitness and are looking to quantify muscle quality. It’s like the equivalent of a power meter for fitness! Thanksgiving is tomorrow, and if you are one of my San Diego personal training clients, you don’t want to sabotage all of your hard work. Did you know that the average person consumes over 2000 calories at the Thanksgiving dinner table? For some of us, this is more than we should be consuming in an entire day! Here are a few tips to keep you on track with your fitness and dietary goals while not depriving yourself of a good Thanksgiving meal! 1.) Eat lots of skinless Turkey- Keep your protein to carbohydrate ratio in check by eating lots of Turkey. Skip the skin which is loaded with fat, sodium, and cholesterol though. 2.) Don’t wait all day to eat- A lot of people hold out on eating all day for Thanksgiving dinner. If you eat a good breakfast and lunch before Thanksgiving dinner, you will be less likely to overeat. 3.) Portion sizes- If you want to try all of the delicious dishes at the table, stick to smaller portions. 4.) Skip Seconds- If you have eaten well throughout the day and have a good ratio of protein to carbohydrates on your plate, you shouldn’t need a second serving. Resist the temptation. 5.) Say No to Leftovers- If you are cooking, try to properly gauge how much food to cook based on the number of guests you will have dining with you. Then you are less likely to be stuck with leftovers. Still have leftovers? Why not send them home with your guests! 6.) Up your water intake- Chances are you may be having an adult beverage with your meal. To even out the effects of alcohol and to avoid a second glass, make sure you are drinking plenty of water during your meal. 7.) Exercise – Get out there and get moving the morning of Thanksgiving – I know I will be heading out for a run to burn some calories before indulging in dinner. By practicing these healthy Thanksgiving tips, you should stay slim through the holidays. Next challenge…Christmas! Looking for an afternoon pick-me-up or quick breakfast alternative? 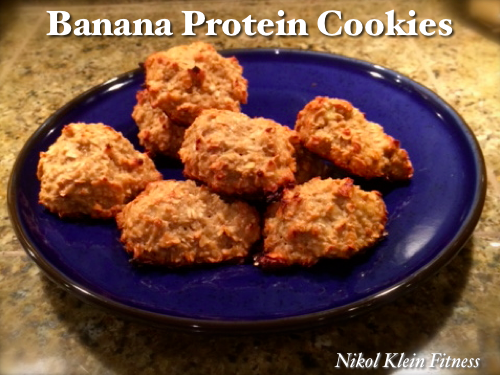 My banana protein cookies are a healthy and tasty meal on the go. The ingredients are simple and you can whip these up in just 15-20 minutes. Instructions: Preheat oven to 350 degrees. Mash the bananas well in a mixing bowl. 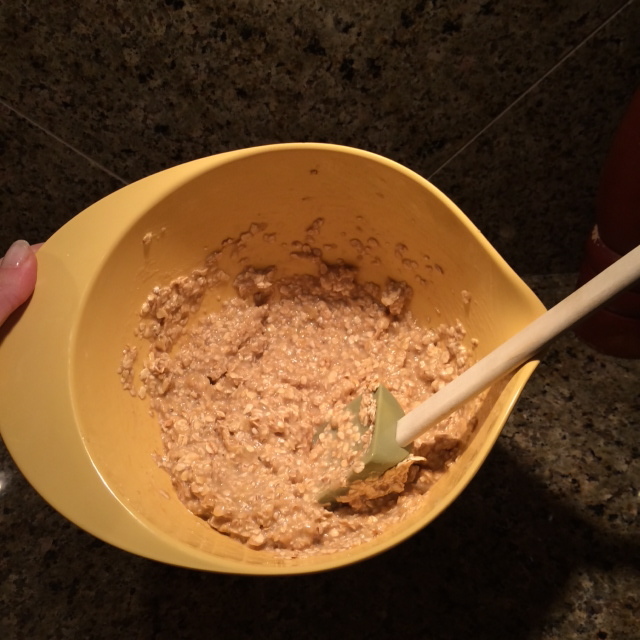 Add protein, then oats. Add more until desired consistency is reached. Form into balls and place on cookie sheet. Bake for 15 minutes. Cooking time my vary. This recipe yields 10-12 cookies. A few weeks ago my favorite brand of plant based supplements, Vega, had a product recall. This left me in a state of shock as not only was I completely out of my favorite supplements, but I could not purchase any since the shelves were cleared at my local Whole Foods stores. You may think that this is no big deal but as a girl who is on a strict bodybuilding program, I drink this stuff three times per day – I had to find an alternative and fast. 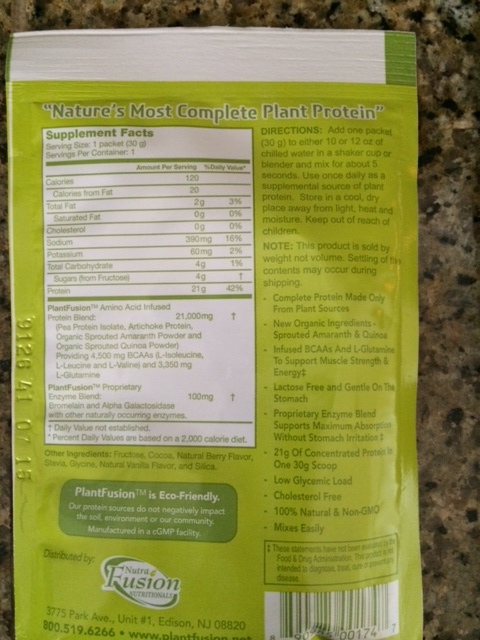 I looked at the ingredients in many of the other plant based protein powders and was not impressed. They either had too many carbohydrates, too much sodium, or simply not enough grams of protein per serving. 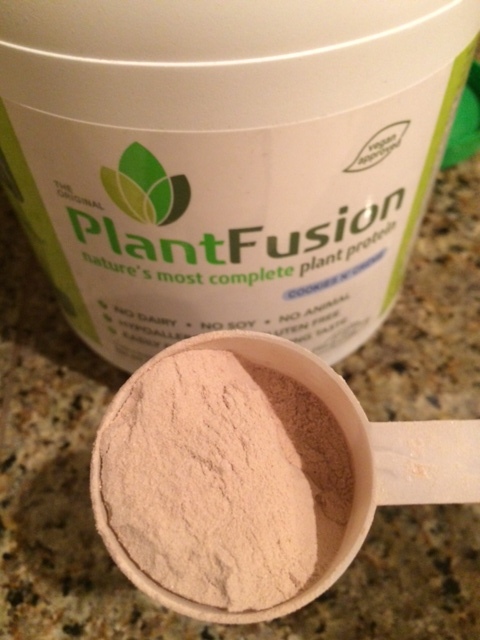 On the bottom shelf I came across a protein called Plant Fusion. After carefully studying the macros and Amino Acids profile I decided to pick some up and give it a try. The flavor that was in stock? Cookies and Cream. Sounded like a great alternative to the boring vanilla and chocolate I had been drinking at the time. When I got home and opened the container, I couldn’t believe how smooth the consistency of the powder was compared to the other plant based protein I had tried. This meant that it would mix well and it did! The flavor was good too – although the Cookies and Cream did not taste like Cookies and Cream, it was a nice chocolate flavor that I would have no problem drinking multiple times per day. The next time that I went to Whole Foods I decided to try another flavor – vanilla. (yes, Vega still wasn’t in stock) This flavor was great as well. 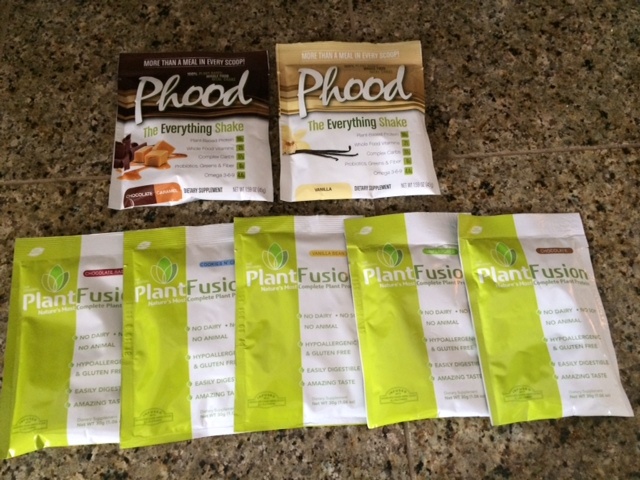 Plant Fusion was awesome to send me samples of the other flavors as well and I have to say, all of them are fabulous. This protein is easily digestible and doesn’t leave you feeling bloated or gassy like some plant based protein will. Check out the nutrition facts and amino profile in the picture below! After weeks of using Plant Fusion, I have made the decision to continue using it in place of Vega. Now only does it taste just as good but it is a better price point too! Afterall, drinking three of these shakes a day gets a bit pricey and if I can save $20 per tub, that’s a plus. Give this stuff a try. Go to plantfusion.net or check out your closest natural foods store to see if they have it in stock.